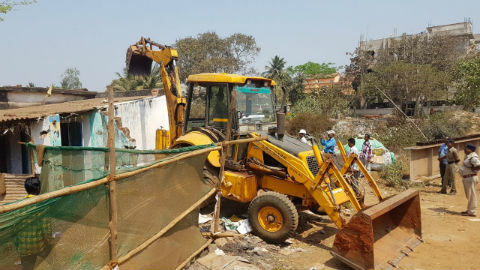 Bhubaneswar: Good news for the people of Pokhariput and nearby Bhimatangi, Kapilaprasad, Old Town, Palaspalli, Jagamara and other localities as the two major encroachments near the railway over bridge (ROB) near the LIngaraj Road Passenger Halt were demolished and removed today by a joint eviction drive of Bhubaneswar Municipal Corporation, Bhubaneswar Development Authority, Public Works Department (PWD) and Commissionerate Police. “An asbestos house and an RCC (reinforced cement concrete) structure was blocking on the way of the ROB work from the Bhimatangi-end towards police and PWD had given us the requisition to evict the two structures so that the work over the railway track would be possible,’’ said an Enforcement official of BDA. President, Resident Welfare Association Kalunanda Nagar, NK Patnaik today welcomed the steps by the civil administration and also urged the PWD official to complete the structure as soon as possible. 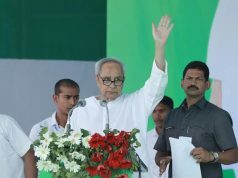 The foundation stone of the rail over bridge was laid during the Local Self Government Day celebration on August 31, 2013, by Chief Minister Naveen Patnaik. 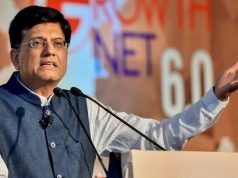 The Rs 36.74 crore project is being jointly executed by the East Coast Railways (ECoR) and the Public Works Department of Odisha Government. While the ECoR has finished the construction over their land, PWD has constructed a major portion, but small portion was left out due to the encroachment issues. While the ROB proper is of 401-metre long, the approach road from Bhimatangi-end will be of 161 metres and from Pokhariput-end 88 metres respectively. There are 15 pillars in the design. While the ECoR has constructed three, PWD’s share is 12. The two abutments at each-end of the ROB respectively along with the approach road are being be built by PWD. Abutment in a ROB is the point where the approach roads meet the bridge.